TaylorMade Golf is introducing the new RocketBallz golf ball, a three-piece multi-layered golf ball engineered for insane distance and exceptional short game performance. 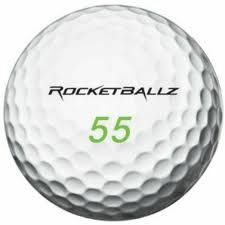 With a name synonymous to its performance, the Rocketballz golf ball rounds out the new franchise which also includes a line-up of drivers, fairways, hybrids and irons. Golfers of all abilities will add distance to all facets of their game without having to compromise performance around the greens. RBZ is the ultimate “bomb with bite” golf ball. The ball speed and distance gains from RocketBallz, comes from a proprietary REACT™ core technology and new SPEEDMANTLE™ for increased velocity and added iron spin for all swing speeds. Combining this REACT core and SPEEDMANTLE technologies together, TaylorMade is able to make golf balls that push the velocity limit and maximize distance. Great feel with improved spin and control around the greens comes from the company’s proprietary thin and soft IOTHANE™ cover. Coupled with the softer SPEEDMANTLE material this ball will provide increased short game spin with mid and short irons, allowing the ball to bite and hold the greens.